Let’s face it: college is exhausting. From homework to projects to finding time to just eat, let alone finally hanging out with the cutie you had your eye on in class. Where is the time to sleep?! Seen this triangle before? Well, rumor has it, you only have two choices, so take your pick. As a college student myself, I can attest that this diagram is pretty darn accurate. Whichever two you believe are the most important can determine how successful you’ll be, how stressed you’ll get, and how involved you’ll be with your school. Picked your two options yet? It’s hard, I know. Most people I know would say “screw it” and sacrifice sleep. But what if I told you there’s a way around it? Who says you can’t have all three options in that awful triangle? But the trick is you can’t have them all at the same time. So you must alternate between them. 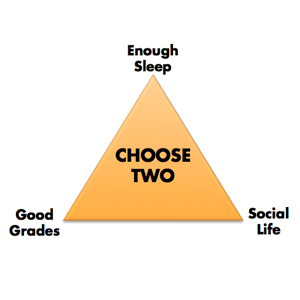 Though I suggest never sacrificing your good grades—after all, that’s what this is all about—sleep, in my opinion, should be the second most important point of the triangle. If you have not had enough sleep (six to eight hours a night), you probably should skip that dorm party. Though it may be hard to avoid hanging out with your friends (FOMO for real), you will regret it when you can barely keep yourself together in the morning and cannot make it to class. (And when you divide your tuition by every class period, you’re looking at $50–$100 per hour—why would you waste that?!) Save the die-hard partying for the weekends; then it might be okay to sacrifice sleep for your social life, assuming you completed your schoolwork during the week and feel comfortable not doing any more. You should be in a relaxed and relieved state when it’s time for bed. So, invest in nice sheets, comfy pillows, and a mattress topper; avoid caffeine before bed; and use eye masks and earplugs to block out light and noise if you can/want to. If noise is a problem and you’re not into earplugs, a good trick is to turn on a fan; this provides “white noise” than can block out the surrounding noises. You can also download white noise apps for your phone. Speaking of noise, one thing college students may not have the ability to control is their sleeping environment: you may get a roommate that stays up later than you and leaves on the lights (hopefully they are a little more considerate than that), or the dorms could be full of other rowdy students. Try talking to your roommate if they’re really impinging on your sleep, and any RA worth their salt will make sure the dorms aren’t so loud that students can’t sleep. But if it sounds like you live in a zoo every night and your RA isn’t stepping in, you could say something to the resident director (RD). Sleep can come easy with a good schedule too, so try to be consistent with when you wake up and go to bed each day. And this may sound sacrilegious, but limit your naps because they may be keeping you up at night. If you have a late morning or afternoon class the next day, you shouldn’t need a nap during the day because you can get a full night’s sleep. But if not, it’s okay to fit a nap into your day because some sleep is better than no sleep. The ultimate answer is the keep your bedroom as stress-free as possible. You don’t want to subconsciously associate your bed with negativity! And if you think can get away with pulling an all-nighter to finish a project or cram for a test, think again. Research also shows sleep deprivation can lead to many problems such as memory issues, contribute to weight gain (a.k.a. the dreadful Freshman 15), and can mask more serious sleeping disorders. Slow down your pace at night by reading a book or watching television so you will eventually become drowsy. Do not deprive yourself of sleep because you think it will get you good grades—because they go hand-in-hand. Education should be your top priority, but sleep is a close second. Besides, when done right, you will have time to party. I am a native of Charlotte, North Carolina, who traveled just an hour away to attend Winston-Salem State University. Although I am following in both of my parents' footsteps in attending this college, I found my own path and passion in journalism. I have always loved to read and write, and want to launch my career doing what I love—because that's what it's all about! I enjoy reporting the news, speaking on politics and community issues, and blogging. As a college student I can be a helpful hand to guide others through it all and find their own passion to pursue.